The U.S.-South Korea alliance faces new challenges in deterring and containing the Kim regime, particularly as North Korea develops nuclear weapons capable of reaching the continental United States. “Never have matters been this serious on the Korean peninsula,” says Col. Daniel S. Morgan, a U.S. Army fellow at the Council on Foreign Relations. The U.S. military is a “war-ready force,” Morgan says, but the optimal U.S. strategy with regard to North Korea would emphasize diplomacy and the long-term goal of denuclearization. What is your greatest concern on the Korean Peninsula today? My greatest concern is miscalculation, which could stem from something as simple as North Korea and South Korea having isolated talks in which the United States, Japan, and China are left out. And then, as a result of that, we could start moving down a different and potentially dangerous path. Never have matters been this serious on the Korean Peninsula and in the broader Northeast Asian region. When you look at the complexity of all the players in this region, with all the different instruments of national power in play right now, I get nervous that there will be some type of action that could make it hard to walk back from conflict. Any armed conflict could escalate into a horrific situation that leads to human catastrophe and severe economic disruptions. My other concern is the U.S. election cycle. When you are running national elections every four years, it can become difficult to sustain a coherent denuclearization policy over decades. Last month, the two Koreas restarted their old military hotline. Do you think there’s value in the United States restoring some sort of military communications with North Korea to help avoid miscalculation? Any ability to communicate is always going to help conflict resolution, without a doubt, but it has to remain inclusive. Trust, transparency, collaboration, and collective responsibility will be critical because this is not just a North Korea and South Korea problem, given how economically interconnected the world has become. Four of the world’s leading economies are in East Asia. Four of the largest militaries are there. It is a complex environment that can’t be dealt with by one or two countries. Any ability to communicate is always going to help conflict resolution. Do you think Kim Jong-un will give up his nuclear weapons? He could. When you look at the options, there’s a spectrum of ways to get to a denuclearized North Korea. The critical element to understand, as part of any diplomatic process with North Korea, is that the country’s standing rests on family legacy, a self-reliant ideology, and nationalism rooted in its coming out from underneath Japanese rule in 1945. Above all, Kim wants the family legacy and the North Korean regime to survive. That’s the linchpin; that’s the leverage point. In the end, he may be willing to give up the nuclear program in exchange for these priorities. So the best option that we have to pursue, using sanctions and other means, is an evolution of the North Korean regime toward this goal of denuclearization, not decapitation or war. Kim Jong-un has also said he wants North Korea to prosper economically, which is another priority of his that we could leverage. Over time, people [in North Korea] are going to realize that they are falling farther and farther behind. It took his family decades to get to where they are, and it’s likely going to take the same amount of time to achieve a regime evolution and denuclearization. What is the U.S. military’s presence on the Korean Peninsula today, and how does it affect our deterrence, readiness, and posture? We have a forward presence, but in 2015 we transitioned from a forward-stationed armored brigade combat team to a forward rotational presence. So we still maintain the same combat capability on the peninsula, it’s just that we are rotating that combat brigade over the span of a year, just like we do in Europe. While we have one combat brigade on the peninsula right now conducting training and exercises and so forth, we have another one back inside the United States training and getting prepared to deploy on a rotation. The rotations enable us to be more flexible with regard to potential threats in Eastern Europe and the Middle East. So it does give us more flexibility with regard to not just the Army, but the joint force. The disadvantage is there is a cost to it. On the other hand, we have increased our combat aviation; our chemical, biological, radioactive, and nuclear defense readiness; and our ballistic missile defense capabilities. So you could say that our combat capabilities have actually increased on the Korean Peninsula. One of the options the Trump administration is debating is a so-called bloody nose strike. What are some of the factors to consider in assessing the viability of a limited strike option like that? There are several valid options under such a “bloody nose” strategy, and it’s our responsibility as senior military leaders to communicate these options and their risks to the force and to the mission, as well as the political risk, and the risk of inaction. By explaining the options and the associated risks, we’re creating a space for our civilian leaders to make an informed decision. A bloody nose option right now with regard to North Korea would carry a lot of risk. A limited strike or a bloody nose strategy means the United States better be prepared to go to war immediately, and risk losing credibility in the region. We cannot be too cavalier with words and actions in this situation. You have to have a credible military threat in any deterrence strategy. A limited strike or a bloody nose strategy means the United States better be prepared to go to war immediately. When you look at the history of U.S. limited strikes—the invasions of Grenada (1983) and Panama (1989–90), the strike against Libya (1985), the no-fly-zone strikes in northern Iraq after the Gulf War in the 1990s—those all had limited risks, in terms of potential casualties and duration of conflict. Those limited strike successes, if you want to call them that, are not applicable to the current North Korean situation. Bloody noses and limited strikes are high risk decisions, without a doubt, especially when you cannot predict the reaction of an adversary that has serious military capabilities. A preemptive strike or limited strike by us against North Korea could result in a massive artillery barrage on Seoul, a chemical or biological attack on U.S. forces in South Korea, a strike against Japan, a strike against Guam, or nothing at all—who knows? Is that really worth the risk? Moreover, if we did a limited strike and then put more forces on the Korean Peninsula, they could undertake a chemical strike to stop our mobilization process and gain time and space on the battlefield. And then we would be at war. These types of strikes also don’t normally end up solving the underlying political problem. Let’s discuss deterrence. 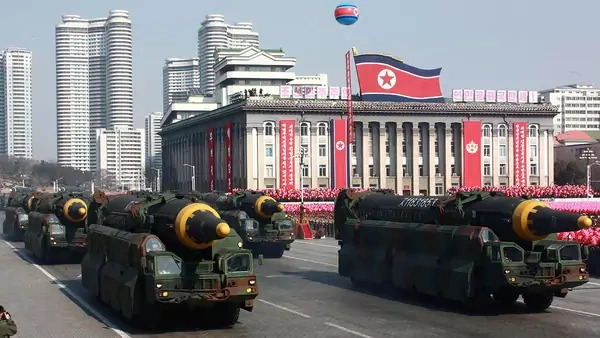 North Korea has long threatened Seoul with artillery, but today it has nuclear weapons and credible delivery systems. Does North Korea deter the United States in a different way today than it did in the past, and how can the United States respond? Will the U.S. approach entail a strategy of containment even though denuclearization remains the political objective? We have a mixture of containment and deterrence being employed now. It is true, though, that over the last few decades, extended deterrence and negotiations have failed to curb North Korea’s nuclear program. However, it is clear that denuclearization remains the political objective, and I think it’s going to require the United States to apply a mixture of containment and deterrence over a long time horizon. The United States must continue to lead the effort with diplomacy and sanctions, while the military prepares itself as a war-ready force—that is what is expected of us. During the Korean War, the United States and China fought on different sides. In the event that hostilities resume on the peninsula, is it necessarily true that the United States and China would oppose each other again? China, like the United States, is not comfortable with a nuclear North Korea. Fortunately, we have significant trade with China and other countries in the region with whom China has relationships. So there are mechanisms that enable us to have discussions with China. There is much more room to cooperate to avoid conflict now than in the past. This interview has been edited and condensed. The opinions expressed in this interview are the interviewee’s own and do not reflect the view of the U.S. Department of Defense or the U.S. Army.